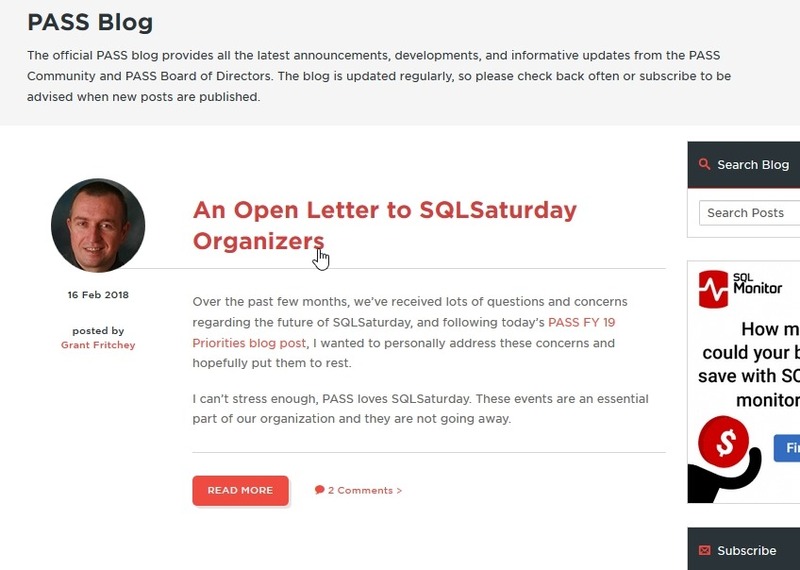 In the spirit of advocating for change in a public way, I’m writing this letter to ask you to revisit your policies and processes and embrace the transparency that we, members of the PASS organization, deserve with regards to the SQL Saturday events. I am directing this to you, Mr. Martin, after seeing your tweet, with the hope that you will follow through and not only provide feedback, but conduct a root cause analysis that updates future decisions. I also am hoping these are not merely words, but also the beginning of some action that you take and about which you publicly disclose the results. A change was recently made to the SQL Saturday site that requires speakers to register for an event before their submissions can be approved. I realized this when a fellow speaker posted a note on Twitter. While there are potential implications here that are disruptive for event organizers and speakers, those are worthy of a separate debate. In fact, they are worthy of debate. Today, I examined the PASS blog to look for an announcement. This what I saw. The last update is from Mr. Fritchey, noting how much PASS wishes to express their affection for SQL Saturday. I appreciate the Board of Directors, most of whom are fellow speakers, may feel that way, but I’m not sure the organization believes this. Again, a separate discussion. Early on in the life of SQL Saturday, a few people had to make decisions, but those decisions were publicized, with conversations with organizers and speakers. When fundamental changes were made, we announced changes publicly to ensure that others were informed. We setup a board of advisors to help ensure that change was made in a more open way, and to solicit feedback. Andy continued to provide updates later, even as PASS has declined to do so. That doesn’t seem to have been done any longer. As I scan through the blog, I see no announcements of changes to SQL Saturday. The last posts were from 2016, when the 600 mile radius was announced and then a subsequent post explaining the reasoning. Once again, almost two years later, PASS lacks transparency and vision. There are no discussions on slack that I find, NDA or otherwise, no emails I’ve received, no list of changes or updates. a roadmap – is there a public one? Even one without dates. I appreciate that there may not be funds for future changes, though there are obviously some still in progress. However, this is separate from funding. This is a process and governance issue that should be addressed. It’s also simple common courtesy. Bravo good sir. Much more eloquently stated than i could have conjured up. Thanks for sharing this. I noticed the word “deficit” so I went hunting for the 2018 budget. Holy smokes, it looks like Microsoft has basically pulled almost all sponsorship funding, something like a $400K-$500K drop. Did I read that correctly, or are maybe the MS funding numbers moved to a different (non-MS-labeled) budget line? Nor were the webinars: http://www.pass.org/Community/PASSBlog/tabid/1476/entryid/870/An-Open-Letter-to-SQLSaturday-Organizers.aspx recorded. Hoping the right people at PASS see this and actually act on it. I appreciate Grant taking the time to respond to a lot of the SQL Saturday concerns a little while back, but even that didn’t seem to be comprehensive. There have been quite a few changes that affect the organizers and from what I can gather, they’re almost all done without actually _talking_ to the organizers to get feedback. The 600 mile radius thing is just short-sighted, considering that most attendees aren’t really likely to travel up to 1200 miles between sessions. For example, 600 miles from Nashville covers a HUGE amount of potential events. With the latest change about presenters needing to also register as attendees apparently only being found out through Twitter, there’s a real need for greater transparency and actual engagement with the community. I’m glad that Mr. Martin is looking into this, but from the general chatter in the community, this caught way too many organizers and speakers by surprise. Steve, we missed the mark on communicating this change. We can do better and I commit to improving the communications process through my actions and encouraging the others who serve our community to up their game as well. With regards to the change and it’s downstream effects we are reviewing that as well. Thanks for the note, Tim. My concern is that this is a continuing “miss the mark” item with PASS and your HQ. I hope you do improve things. I wonder if the mark keeps being missed because PASS’ default to secrecy. I’ve been struck by their constant and unnecessary use of NDAs; even this post’s mention of NDA shows how ingrained they are in PASS culture. I find this problematic and strange for a community-oriented professional organization that puts on conferences. I think this is the problem. There is a fear of being transparent and perhaps having people complain, which is what happens no matter what. That’s why I focused on governance and not the impact of the decision. All, I too focused the energy I had available yesterday towards improving transparency and communication between all of us – focusing less on this particular process change itself. I’m pleased with the process HQ and our Community Advisory Board arrived at late last night with regards to an improvement in communication of changes. I’ve asked for a final version to be drafted that can be shared so please stay tuned for dissemination through more appropriate channels than a blog. Single channel communication, while appropriate some times, is not *always* appropriate. We need to do a better job with communicating change and that commitment was recognized. The new executive board came into this term with a goal of improving transparency and that is why I jumped on this when I saw we missed the mark. I am proud of how quickly our team picked up on that and ran with it yesterday. This isn’t just about communicating change. It’s also a step in the right direction to improving all communication between members at all levels of engagement inside of PASS. That’s the commitment I make to you. A thank you to commenters and readers alike, for being engaged and passionate members of the best damn technical community there is. We have these heated discussions because we’re family more than we are peers most of the time… and that’s what makes PASS so special to each of us. Thanks, Tim. What I’d ask more of is that you (the Exec Committee) set some explicit communication milestones and guidelines. Decisions like this ought to be communicated when they are made, not implemented. They ought to be placed in the public sphere for discussion, even if the decision is made and resources allocated. It’s far too easy to make decisions in a vacuum, which is what PASS has done for nearly two decades. Have to agree w/ Steve on this one. Make the decision and announce it when it’s made, not when (after) the changes go live. Some of the concerns might have surfaced when they were announced rather than when they were implemented and perhaps something that could be addressed.